To succeed in binary options trading, a trader must have a successful trading strategy. There are plenty of strategies available for free in the internet. At the outset, all strategies look great. However, not every strategy suits a trader’s risk profile. Thus, it becomes quite important for a trader to familiarize the strategy in-depth and make a detailed assessment before backing it with hard earned money. The following methods will enable a trader to validate a trading strategy in detail. It is the process of applying the trading strategy to a stream of historical price data. Even though the conditions are not similar, it enables a trader to understand how the strategy will work in a real trading scenario. Ineffective strategies can be quickly identified thereby avoiding wastage of time and money. Back-testing can be done through MetaTrader platform or even Microsoft Excel. For back-testing to be done, a trader should manually check hundreds of candles for entries and exits using the same time frame, which is going to be used as the binary options expiry period. Traders who are proficient in creating expert advisors can perform back-testing in a simulated environment. The winning ratio matters the most in the summarized result. The winning ratio should be greater than the minimum threshold (discussed below) of success percentage required to benefit in the long run. This is the age old method of evaluating a trading strategy. The process involves writing down the entries and exits on a piece of paper whenever a trading opportunity arises on line with the developed binary options trading strategy. The process is continued for at least a month to ensure that the strategy is applied in different market conditions. At the end of the month, a detailed analysis of the trades is done, as discussed below, to decide whether the strategy is suitable for employment in a real trading account. This is usually the final step before implementing a strategy on a real account. A demo account provides a replica of a real trading environment. A trader will be able to understand and access all the features available. The account is loaded usually with virtual currency for the traders to test their strategies without any risk. A trader should try the strategy in different assets and expiry time so that a detailed assessment can be made at the end. The strategy should also be tested during different trading sessions (Asian, European and US market). We provide a list of binary options brokers that have demo accounts if you need one for testing. Once the data pertaining to many trades are collected through one or more of the methods discussed above, a trader should test the performance of the strategy as follows below. 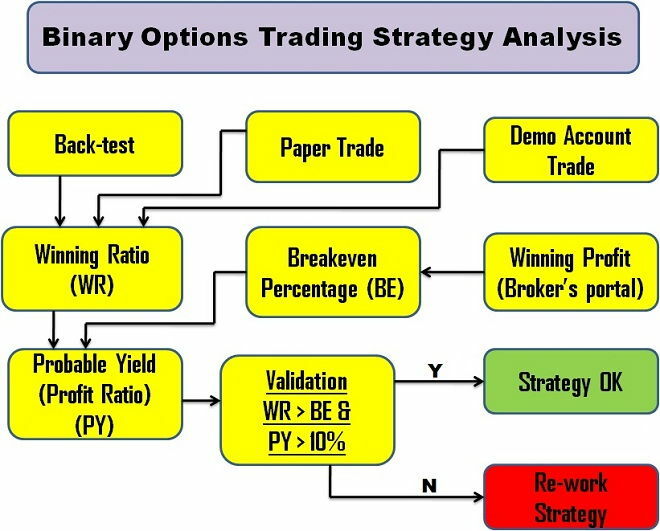 To assess a binary options trading strategy in detail, the breakeven percentage should be calculated at first. It is a well-known fact that binary options brokers normally do not offer 100% return on every winning trade. The profit percentage usually ranges from 65% to 92%. On the other hand, a losing trade simply means that a trader will lose the entire capital locked for that trade. In a case where the broker offers a rebate, as much as 15% is paid back to the client. BE = 100 / (100 + 80) = 0.5555 or 55.55%. Thus a trader should win at least 56 trades out of every entries made to prevent capital erosion. The data collected from the paper or demo account trades should be used to calculate the winning ratio. If a total of 65 trades had resulted in profit out of 100 trades taken then the winning ratio is 65 / 100 = 0.65 or 65%. This value should be greater than the break even percentage. Meta Trader’s back-testing platform provides the winning ratios upon valuation of expert advisors. So, there will not be any need to calculate the percentage manually. The trading strategy is considered successful if its winning ratio is higher than the break even ratio. Let us assume that the strategy has a winning ratio of 65% and BE of 55.55%. Then: PY = 65 – 55.55% = 9.45%. The total traded value would be 100 * 20 = $2,000. For any given trading strategy, the winning ratio should be higher than the breakeven ratio. Similarly, a trading strategy is considered to be efficient as long as it has a high PY ratio. Using the data from back-testing, paper trade or demo account trading, a trader will be able to judge the performance metrics (as explained above) of a trading strategy and arrive at a conclusion. Before a trader begins to trade on a real account, it is a must to have a precise idea about the metrics mentioned above. Only then a trader will not feel jittery when he faces an occasional series of losses.